Very local, known in Presque Isle Co. only from Lake Sixteen, and in Cheboygan Co. from another lake of the same name not far away (also known as Little Lake 16) and from nearby smaller bogs and marshy mucky hollows, which are the remnants of former bogs. Primarily a species of the Atlantic Coastal region, from Newfoundland to Delaware, with a few sites inland in Indiana, New York, Ontario, and Michigan. 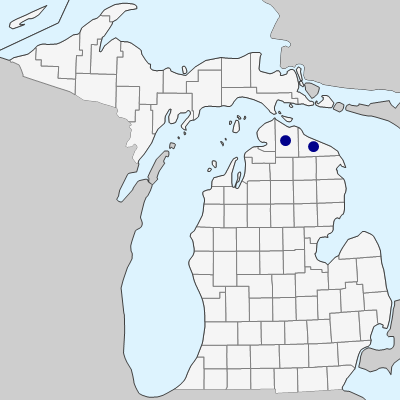 The Indiana sites are close to Michigan, and the species is likely to occur in southwestern Michigan. 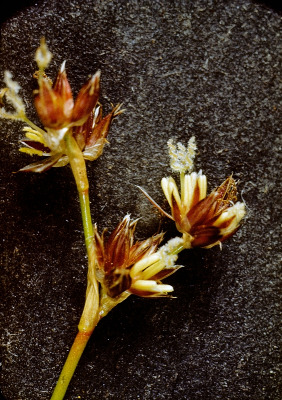 Flowers chiefly when water levels are down; usually remains vegetative, with copious filiform submersed leaves from the rhizomes, when submersed (in up to about 6 dm of water). These tufts of leaves somewhat resemble Schoenoplectus subterminalis and Eleocharis robbinsii, which may both be growing with J. militaris, but the hair-like leaves of the latter are easily distinguished by their reddish tinge and by the conspicuous cross-partitions characteristic of this group of Juncus. MICHIGAN FLORA ONLINE. A. A. Reznicek, E. G. Voss, & B. S. Walters. February 2011. University of Michigan. Web. April 21, 2019. https://michiganflora.net/species.aspx?id=1517.